I have been an Instrumental Music teacher for over 28 years in the public school system. I feel my experience in music has facilitated my love and creations of wood projects. I started in Woodworking in 1986 making things for the house and eventually getting into custom furniture. In 1990, I became interested in wood turning after doing a project that required several spindles for my daughters crib to be made on a lathe. It was then that I was hooked. It wasn’t until 2001 that I became serious about my work. With enthusiasm, I began taking classes all around the country and attending as many workshops as possible. I have just begun to display my work at various locales and juried shows. I look forward to the future! 2012Accepted into American Associated Woodturners juried exhibit "A Walk In The Woods" Opening in San Jose and traveling to St. Paul Minnisota in the Fall. 2015 Accepted into American Associated Woodturners juried exhibit "Merging" Opening in Pittsburgh and traveling to St. Paul Minnisota in the Fall. 2015 Colorado State Fair Exhibition "Abstract Art Award, Scuplural Award"
All of my work is inspired by nature, travel, family and my vocation as a music teacher. 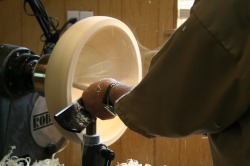 Each piece develops as it is turned on a lathe. Many times what is planned, changes as the wood grain is exposed and shaped for each piece of wood has a character which, respectfully, needs to be revealed. After the shape is established, I will not hesitate to use other media to enhance or change the effect that I am after, ie. texturing, carving, dyes, airbrushing, gilding, resin, pyrography, and various types of paint. Each piece is either oiled and buffed, or lacquered and buffed to the appropriate sheen. All wood that is used in my shop is found wood. It comes from tree trimmers, downed trees or wood that is exotic in nature. I feel empowered to make something that will hopefully give others pleasure and joy from what was overlooked. Each piece will hopefully give you a place to start imagining what you see. It is my wish that spectators enjoy experiencing these works as much as I have enjoyed creating them!